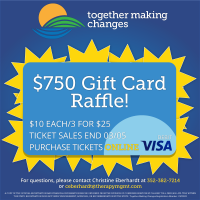 Together Making Changes $750 VISA Gift Card Raffle! Tickets can be purchased between February 4, 2019 – March 5, 2019. Drawing takes place March 6, 2019. Our Billing Department is holding a $750 VISA Gift Card Raffle! Tickets are on sale for $10 each or 3 for $25 and are available online here. For questions, contact Christine Eberhardt at ceberdhart@therapymgmt.com or 352-382-7214.